There are four types of brainwaves generated by humans. Beta waves are produced when we are highly engaged in mental activity, alpha waves are produced when we are in a more relaxed state, theta waves occur during daydreaming, and delta waves occur during sleep. A theta brainwave state is desirable because this is when we are at our most creative, generating new ideas effortlessly. This can occur spontaneously when we are on autopilot doing mindless activity such as running, taking a shower, or driving to work. However, you can also induce a theta state by meditating, with or without the aid of music designed to lower your brain frequencies. Set a timer. 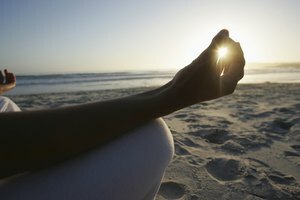 If you are just starting to meditate, try 5 or 10 minutes to start. Gradually progress up to 30 minutes, an hour or more. By setting a timer you relieve yourself from the distraction of wondering how long you've been meditating and worrying about losing track of time. Sit down in a comfortable position. You can sit cross-legged on the floor, on a meditation cushion or bench, or on a chair. It's important to be as comfortable as possible. You want to hold the position without distracting yourself by making adjustments while you're meditating. It's not recommended to lie down, as you may fall asleep unintentionally. Close your eyes and focus on your breathing. Gently breathe slow and deep, following each breath as it flows in and out. Breathe in through your nose and breathe out through your mouth. Count each full breath as it goes out, stopping your count when stray thoughts enter your mind. Try not to get attached to the thoughts--let them drift away and begin counting your breaths again, starting at one. The object is to notice when your thoughts wander and gently guide your mind back to the present, to your breath. Continue this until the timer goes off. The more frequently and regularly you meditate, the easier it becomes and the more you can remain in a creative theta state for longer periods of time, even when you are not meditating. There are many CDs with music that uses binaural beats, monaural beats, and isochronic tones to help induce a theta brainwave state during meditation.